I always make a big pot of soup, chili, or stew before holiday company comes. I mean the company that is coming to stay, not just the folks for the big dinner. Holiday entertaining generally means 3-6 extra people in the house and they are often hungry and not necessarily on my schedule. I have learned to have a big container of soup in the fridge for everyone. It isn't assigned to a meal, it is just there for the emergency hunger pangs between meals, late evening or when schedules get mixed up. Everyone knows that there is a lot in the fridge that can't be touched, but the soup is always available to be enjoyed. My sons-in-laws truly appreciate this. 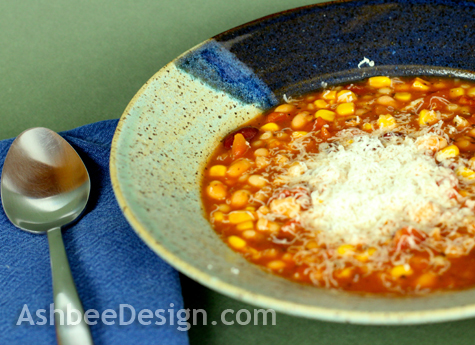 I have several recipes that I use but here is a favorite super easy winter-time soup created by my husband David. He read the label on a classic can of tomato soup and was stunned to see how much sugar is in it. He started creating his own version with very, very little added sugar. We call it Zesty Pantry Tomato Soup because it can be made from pantry stock. Here is the recipe. You'll need a good can opener. Combine all the ingredients in a large dutch oven. Heat over medium high heat until hot, stirring occassionally. Allow to simmer for about 15 minutes. Serve topped with grated parmesan cheese. If you like your tomato soup creamy then just blend this with a stick blender right in the pot. Yum! Reheats well by the bowlful in the microwave. And what did I do with all those empty cans? I spray painted them flat black, glued them together using hot glue and a wide burlap ribbon, and added another ribbon and a few of my autumn book page leaves. These were used for distributing silverware on Thanksgiving. With twenty-one for dinner I had to split the group up. I had one large buffet and then had a table in the dining area, one in the family room, and one on the sun porch. 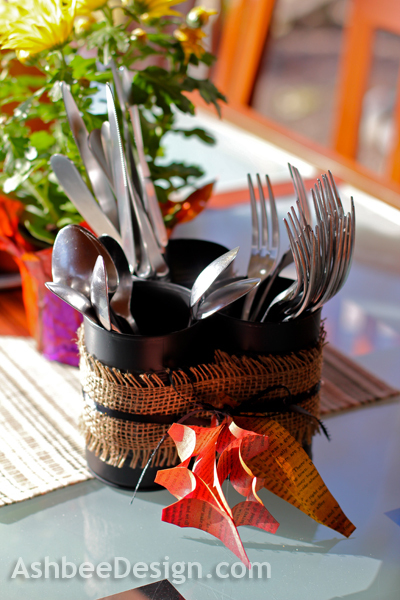 Each had a centerpiece and then silverware, napkins and place mats for 8. The silverware was in one of these three can containers on each table. Got a little recycling in as well.